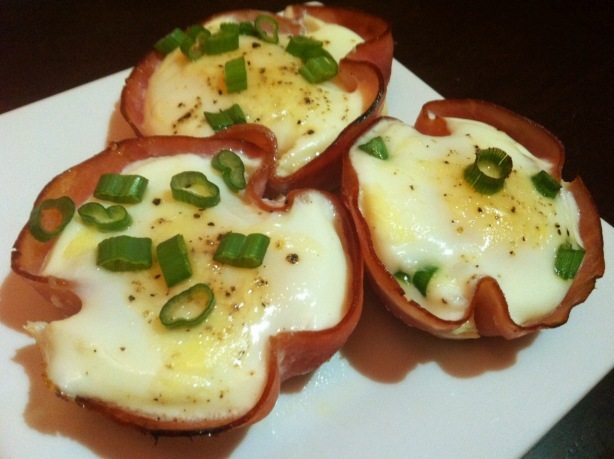 As my CrossFit Gym is one a 30-day Paleo diet challenge, it has inspired me to eat these baked eggs in Canadian bacon cups. This is one of my favorite new recipes because it’s easy, it’s delicious and it’s perfectly portioned. I make them over the weekend and store the leftovers in the refrigerator. I give them a quick reheat and enjoy the egg cups for the next couple of days. Two baked eggs has 290 calories and nearly 20 grams high-quality protein. Partner them with some fresh fruit and your coffee or tea and you’ll be satisfied for hours. 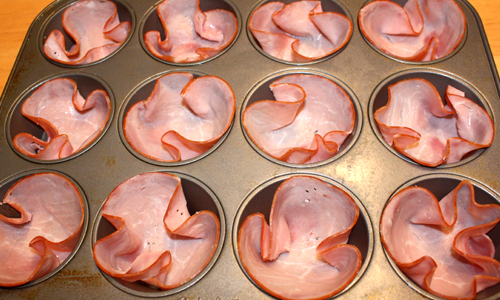 Lightly coat eight muffin tins with olive oil. Place 1 slice ham into each muffin tins (fold into fours to make the ham ruffle.) Crack one egg into each cup; and sprinkle each egg with pepper. Bake in a 375-degree preheated oven for 12-15 minutes till the white looks set but the egg is set and yolk is still slightly runny. Top with chopped scallions and serve. For another great Paleo-inspired high-pro breakfast, try my protein pancakes recipes made with eggs, nut butter and bananas. A great site for more healthy, high-protein recipes is Everyday Paleo. Because a protein-rich breakfast may help curb hunger throughout the day, check out some of their breakfast recipes. 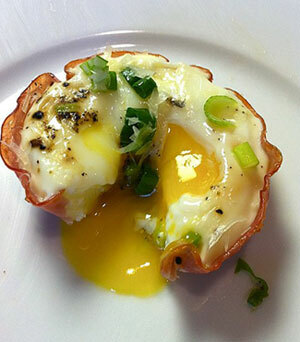 Those little egg cups look wonderful and easy too. Thanks for the inspiration!! Made these this weekend and they were so delicious! Will the bacon be crispy cooked this way? These look so delicious and so easy! So it’s saying its the Canadian bacon, but it’s telling you to put ham. I’m sure both are great but I’m wondering the difference in the nutrition facts..? From the labels I read, Canadian bacon seems to be the leanest cut of ham…but look at the packages when you shop and choose one that is the lower in calories and total fat. I believe that will generally be Canadian bacon. Just made this and it turned out amazing! I love and appreciate your sharing this! GREAT! So glad to hear it!!!! How about making them into eggs benedict? Toast a couple of English muffins and make some hollandaise sauce…then, put muffin on plate, top w/the baked eggs cups and then the hollandaise. Sprinkle the green onions on top….sounds too good to be true. This receipe is nothing short of being “maa veel ous darling”. Nothing short of excellence. Thank you for making eating a pleasure and not a chore! !